Camera shake is one of the biggest bugbears for photographers. It happens when the camera moves during the exposure, so it’s closely tied to shutter speed. The slower the shutter speed, the greater the danger of shake. We’ve all experienced this frustrating problem after not keeping a close enough eye on our shutter speed in low light conditions, and there’s nothing worse than bagging what looks like a great shot and then, on closer inspection, realizing it’s not quite pin-sharp. We can also relate this issue to the focal length of the lens – telephoto lenses magnify any shake to make it appear a whole lot worse. You need to watch out for camera shake when you’re shooting indoors or in low light, because this is when the camera will have to use a slower shutter speed. Normally, you’d counteract this by increasing the camera’s ISO setting to force the shutter speed back up again, and that’s what we should have done here. Instead, we used a low ISO, which resulted in a slow shutter speed of just 0.4 sec – no wonder the details are blurred! In this tutorial we’re going to show you how a handy tool, that was introduced with version 14 of Photoshop Elements, can help. It’s called the Shake Reduction tool and, as the name suggests, it does exactly that, reducing camera shake caused by any movement from the photographer. 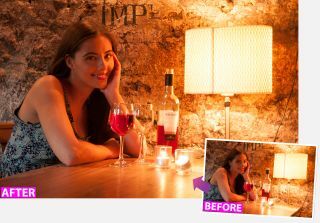 With a click of a button you can remove the effects of camera shake from your images, however, for the best results, take full control by delving into the additional options in the tool to tweak your image for more accuracy. When positioning the Shake Region box, if a warning triangle appears it means that the area cannot be analysed, so you will need to move it or enlarge the region until it can. Click-drag the handles of the box to resize or move it around using the central pin. The Shake Reduction tools are found in the Enhance menu, and you can use them in both the Quick and Expert modes. The top section of this menu is where you’ll find all the ‘Auto’ options, but you get much more control if you choose the manual Shake Reduction option, further down. The first thing you’ll notice is the default ‘Shake Region’, the area of the image analysed for movement. This is used to work out the shake correction needed, which is then applied to the whole image. You move the Shake Region to a more suitable location by dragging the centre. Here, we’ve positioned the first Shake Region over our model’s face, since this is where we want the best shake correction. But we can add another Shake Region for another key area by clicking the tool at the bottom of the window and dragging out another selection marquee. You can check the effectiveness of the Shake Reduction tool before you commit to processing the image. If you click the zoom button at the bottom of the window, you’ll get a square ‘loupe’ which you can drag around the picture to check how well the details are being rendered.